NOW I can say that, my wav player IS ABLE TO PLAY 8 BIT MONO/STEREO with maximum bitrate of 1300kbps for mono and 1600kbps for stereo ... ie it can play an 8 bit mono wav of sampling frequency upto 160KHz and stereo upto 96KHz without any noise or trouble!!!!! (at OSC 16.450MHz). 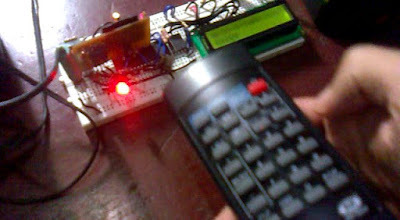 TV remote control to control the player remotely. Maximum bit rate supported - 144 kilobytes/second. Automatic repeat from the top after all the songs are played. Additional bitrate adjustment on remote ( << , default, >> ). Forwarding (fwd) option while playing. (seconds could be set on a macro). MMC card initialization, reading, writing and interfacing are already explained on my previous post http://vinodstanur.blogspot.com/2011/07/attempt-to-access-memory-card-mmc-using.html , so I think no need to repeat in again. Any way, in short words, MMC/SD cards are to be initialized by proper commands and it enters to working mode (SPI mode) only if it is initialized successfully. So, here I used a 16x2 lcd to display many things. At first, it displays error message (if any) while trying to initialize the mmc. When it is initialized successfully, it shows MMC INITIALIZED message on lcd..
Now, the next step is to check the boot sector of the MMC card (sector 0) to check if it contains a FAT16 file system. For this, we need to read the sector 0 of MMC card to a buffer. Here I used a 512 byte buffer. From the boot sector data, we could see what file system is there in the MMC card. My code is only for FAT16, so if I found it is not FAT16, then it display an error ie NOT A FAT16. If it found FAT16, then it reads few more data from the buffer and calculates sector number for the data start, fat start and root directory start. Also it detects the sectors per clusters. Each sector is 512 bytes. These four data is required for the further activities on MMC/SD card. So those are stored as global variables. Now the next step is to get into the root directory. (MMC commands and the sector reading is covered in my previous post as linked above). Now we need to load the first sector of root directory into the 512 byte buffer. Then, each root directory entry is of 32 byte (in general for 8.3 file name format). Each entry contains details of a file or folder in the root directory. 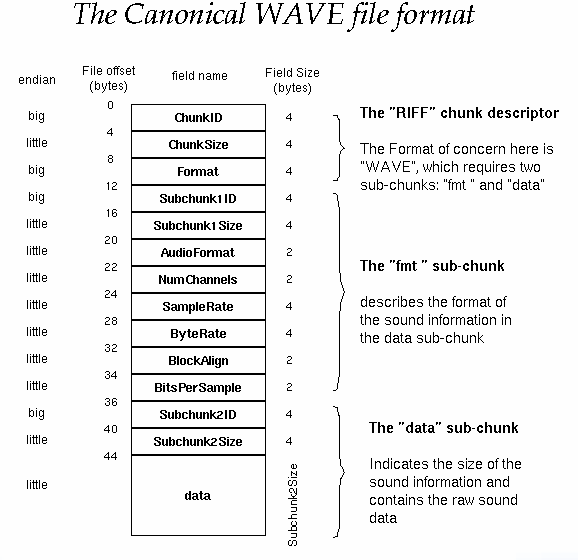 From there we can read the file name, file attribute, actual file starting address (cluster address) and many more... We are interested in the file name extension (WAV), the file attribute and the file starting cluster address. 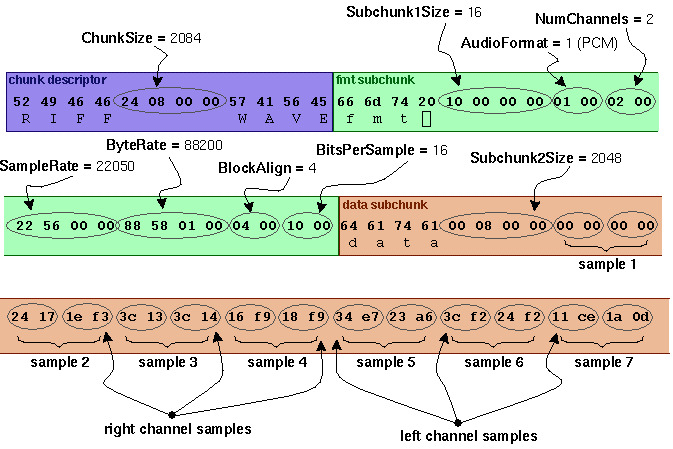 So we compare the extension with the string "WAV" and if it matches, then we return the cluster address of the wav file. Now we could read the first cluster (a group of sectors, size depends on the size of MMC/SD). We could find the sector address from the cluster number using as equation. (u can see that on my code). Now after reading and playing all the sectors in the first cluster, (playing the data will be explained after this) then we need to find the next cluster number of the same file. A file may not be distributed on the memory as one section. Instead, it can be splitted into parts and placed here and there to utilize the free memory effectively.... (actually this happens only when there are some deleted files and we add new files to the MMC/SD). So we can't predict that the next cluster of the file will be successive numbers... But all the cluster order for each file is perfectly tracked on a linked list called the FAT...(File Allocation Table). Each cluster number have a unique position on the FAT. We already calculated the FAT starting address. From the FAT, we could get the next cluster number of the file. Since it is a linked list, the 16 bit data present on the 1st cluster number position will be the second cluster number. Now after reading the second cluster, we check which is the third cluster by checking the data on the location of second cluster position,,,This continues until we read a 0xffff from a location on FAT... This denotes the end cluster for the particular file..
We have first cluster number and we calculated the sector starting address of the particular cluster number. Now we read the data from first sector of the file and from there we could get the bitrate, sample rate, number of channel (stereo, mono) and many more.. We take the bit rate and use it to set the timer interrupt frequency... Now the timer interrupt is generated according to the bitrate and channel number. 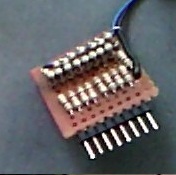 Now on each timer interrupt, an 8 bit data is introduced to the OCR register of Timer PWM module. Accordingly it generate PWM signal in background without any CPU resource. This PWM signal could be easily demodulated with an RC filter. If the capacitor value increases or resistor value decreases ,then it will affect the audio quality ie it may filter out some higher frequency components of the audio and may feel it like hearing some thing from an AM MW radio..:-)...So care must be given while choosing RC.. I had implemented RC5 decoding on the same Atmega32. But I think it is not a good method. Becuase, it will be inside the Timer ISR for more time while playing the file. So, most time, RC5 external interrupt will be triggered when the processor is handling the Timer interrupt. Then the external interrupt will be handled only after that and this results an invalid start bit detection inside the rc5 interrupt handler and that will be treated as an invalid RC5 signal. So if we are lucky enough, the first keypress itself will do the job, else we need to press the key for a while or retry after key release... But probably, it will work with in 1 or 2 keypress... So at present I think, the best method is to decode the RC5 outside the atmega32 and send the value via a serial interface for a better performance.. I am using avr-gcc in linux. We need avr-gcc, binutils-avr & avr-libc to be installed before trying to build the hex file. These are available via synaptic package manager. Also, I am using avrdude package to burn the avr, hardware used is usbasp. So the makefile is made according to that... We can also use a simple parallel port burning circuit but in my case I don't have a parallel port in my lap, so I stick with the usbasp. 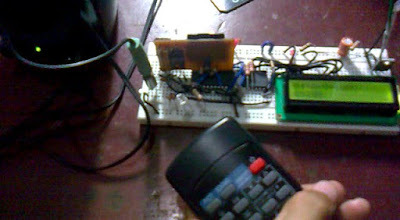 It contains an atmega8 microcontroller programmed with the hex available at usbasp homepage. here are the photos of my usbasp programmer, made according to the circuit diagram and firmware provided at the usbasp home page. You could download the repo from the my bitbucket link.. (posted just below the source code). cd into the directory where the Makefile and c file is moved. How to burn it using usbasp? Just need to type "sudo make burn_hex"
How to burn fuse bits? Just need to type "sudo make burn_fuse"
How to clear the build? Just need to type "make clean"
How to build & burn it without using Makefile? Nice project, what are the fuse settings used ? So, you're running Atmega32 at 16.450Mhz. Isn't that overclocking for the device as it's rated for 16Mhz max. But it doesn't makes any problem any way because this .450MHz is nothing compared to the 16MHz. This is indeed a very nice project. However, I've a very question, which may be pretty off-topic. How do you set the fuse bits with the usbasp programmer? I've bought 2X usbasp programmer built out from the same source as you but both doesn't detects the chip at all when the chip is working at 1Mhz internal clock. I've to just visit my college and set the fuse to use external crystal using universal programmer. Later on, the usbasp programmer works like charm. Is your usbasp programmer capable of setting fuse of BRAND NEW ATMEGA's? If so, could you please share the firmware & circuit on how YOURS in exactly made? Why do #define F_CPU 12000000 but use a 16.450MHz crystal ? If I want to use a 16MHz crystal, should I #define F_CPU to 11671732 ? No it is a mistake, I forgot to update it.. Mine didn't work with D0-D3 grounded, took a few hours to figure out why it wouldn't initialize. My bad, I forgot to read the beginning of the post. My SDCARD initialize without problem, but I understand why it says it's not FAT16 now, because I've a MBR at sector 0. Hi. Amazing project. Two Question. Would work on atmega8 uc? and ... I can use a 2 GB micro SD card? do you mean that your code only works for MMC and not for SD cards or micro SD cards? Also i had a question about remote control. Does all cheap TV remote available in market follow philips PC5 protocol? If not which of them are following the RC5 protocol? please reply me. to match your xtal frequency. 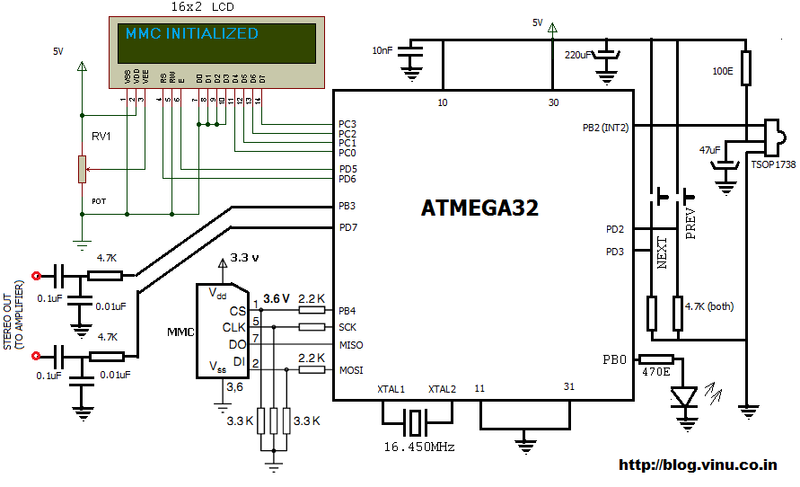 Is it real to do all that on ATmega16 ? I have one doubt...can we use 1GB Micro SD Card.?.. i want try it on atmega 64 kit...will it work on..and what extra peripherals are required?? will work with an 12mhz xtal ??? Hello Vinod, I am working on a similar project. my project is to convert stored text into audio. I tried using 16F877A but I am only getting a beeping sound.Any suggestion on how to go about it please? 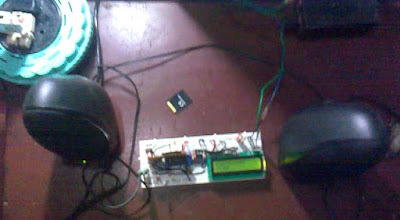 hi my friend.imade your waveplayer with m32 16Mhz microsd avr studio and format with fat(default). but i cant play music. maghsoud abureyhani, I had the same issue, read my previous (old) comments. Very nice project. The specs are very good. Can you make it to play 2 stereo wav files or 4 mono wav files simultaneously ? how can i play a specific file and not just serial wise next or previous? For that you have to parse through the file names in the directory and when it matches your file name string, you should find the data start. But if you are using a FAT library like Chan's FAT or any other, you don't want to worry about all these, U can use those like normal file operations in C. Here I implemented all from scratch in weird manner, I did like this to get the maximum performance out of it, but it will definitely affect the readability of the code. Fine project! How much (appox) Kb code need to implement for: play mono wav files with names like 1.wav , 2.wav ? execuse me sir,can you provide the circuit diagram with DAC? ?